According to Seattle Times’ FYI Guy, Gene Balk on May 25th: From the middle of 2015 to the middle of 2016, Seattle’s population grew 3.1% — faster than any major U.S. city (defined as those with population greater than half a million). At an estimated 704,400, Seattle is now bigger than Boston, Washington, D.C., and Denver. According to the U.S. Census Bureau, other large, fast-growing cities in King County are Redmond (+3.2% to 62,500), Federal Way (+1.8% to 96,800), Bellevue (+1.3% to 141,400), and Burien (+1.2% to 51,000). Renton, Auburn, Sammamish, Kent, and Kirkland also grew. At the same time, according to the Seattle Times on May 30th, “Seattle housing market tops nation in bidding wars and price gains.” Over the past two months, about 90% of houses on the market ended up in bidding wars. 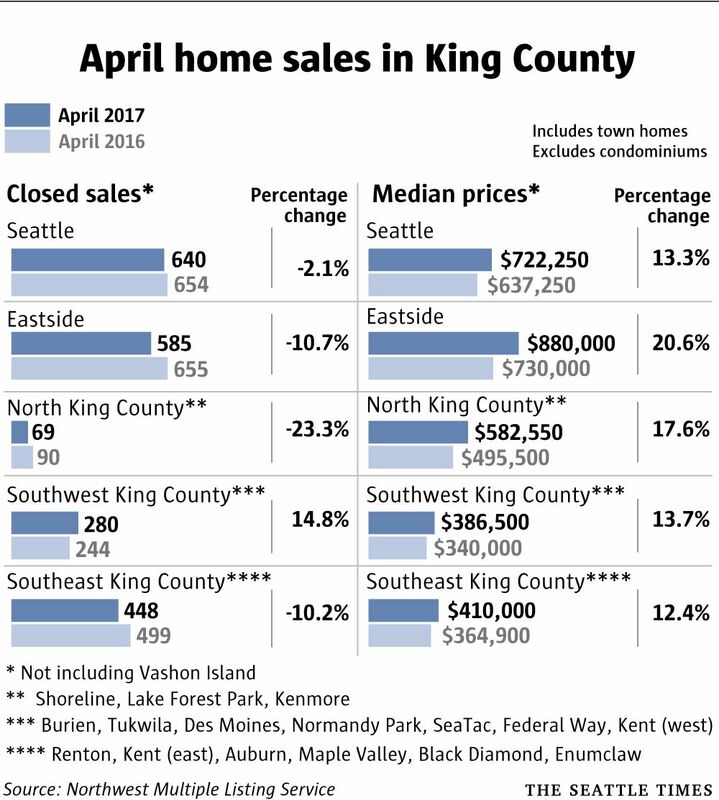 And, according to the Northwest Multiple Listing Service, the April median price for a single family home in Seattle was an all-time high of $722,2500; on the Eastside it was $880,000. Finally, on the last day of May, Crosscut announced, “A city the size of Woodinville is sleeping in our streets.” That’s right. When the tally from King County’s annual count of unsheltered homeless was added to the number in shelters on the same night (January 27), the total came to 11,643. about the same as the U.S. Census Bureau‘s 2016 population estimate for Woodinville. A new counting method was used in 2017, so valid comparisons of the 2017 numbers to those of earlier years can’t really be made. But a homeless population the size of Woodinville is substantial, and 77% of those who responded to survey questions said they were living in King County when they became homeless. Not a big surprise in a place where record population growth is paired with skyrocketing prices for housing. Policymakers, businesses, and philanthropists are working to provide more affordable housing for our growing population — with re-zoning, residential assistance, donations of space, and construction of “tiny houses.” So far, though, it’s been a losing battle.